As a mother of 5, American Kathryn Wiley knows the profound effect a mother can have on her young. Armed with the knowledge that Haiti has the highest infant mortality rate in the Western Hemisphere, Kathryn started a movement. In 2011, she purchased Rockin’ Baby, and decided to evolve the company into a “Mother to Mother” business. Bloom Maternity is estatic to sell the Rockin’ Baby slings and pouches and we just love their mission: For every sling purchased, Rockin’ Baby will donate a new sling to a mother in need, and educate them on its importance. So we reached out to Katheryn to ask her some more questions about Rockin’ Baby’s “Mother to Mother” Movement and what she discovered while visiting Haiti. Why did you choose Haiti for your Mother to Mother Movement? I have traveled all over the world, and to many 3rd world countries. I have now been to Haiti 6 times, and each time the people and the place really impact me. They have so much joy, despite their situation. 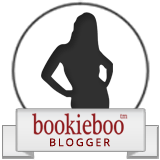 When I decided to purchase Rockin’ Baby from its founders in Los Angeles, I thought it would be great to add a social aspect to the business. Toms Shoes has always inspired me with their success, and a one for one business model was my goal. I immediately thought of Haiti and the fact that the women do not carry their babies there. This is interesting since their roots are in Africa where they carry their babies primarily. I contacted some midwife organizations, as well as maternal programs in Haiti and asked them their opinion of Rockin’ Baby donating slings to the women there. It was accepted in such a resounding way, that there was never another option. I felt almost responsible to be successful in my Mother To Mother movement, and thrilled that after my first trip, I can say it was accepted with open arms and grateful hearts! How many times have you visited Haiti, and what has impressed you the most about the mothers there? I have been 6 times; spending about 4 months there over the years. The mothers are strong, amazing, tenacious women. I definitely think of them when I begin to complain about my load as a woman in America. They have to overcome so many obstacles, including poverty, loss, disease, and so much more…but, they do it with such grace and joy. I absolutely am inspired by these strong women. It is critical I Rockin’ Baby’s Mother to Mother Movement that the Haitian women are portrayed in a positive light; not one that would imply that they are waiting for a hand out! How many slings have you donated? I took 300 down in August for my first sling drop. I have several more hundred to take. I am working on sending my next shipment down, as they are out, and need more immediately. I only took 300 because I could not hand carry anymore. Shipping to Haiti is going to be the biggest challenge, that I am working to overcome right now. I have several contacts in Haiti, and so much support on the ground to distribute and educate the women about the slings. The issue is getting them in their hands. 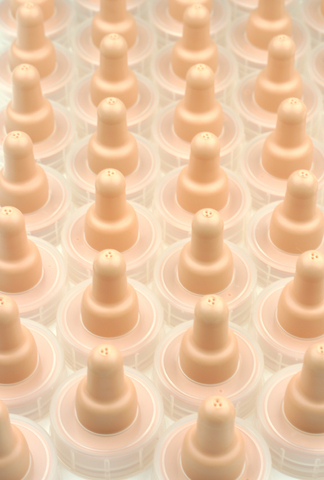 Next Spring, I hope to send a team of Mother/Midwives to Haiti to distribute a few thousand. We personally fit each woman in August, and that is the plan for every one we donate. 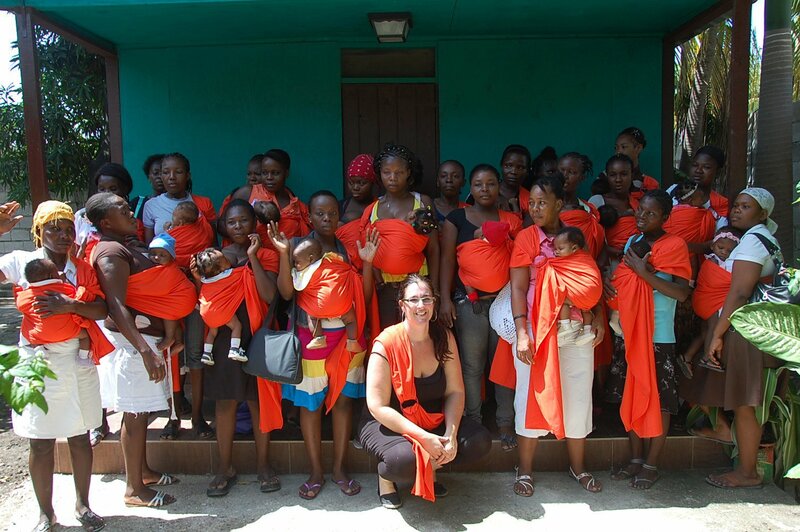 It is critical that the women understand the use of the slings and how to properly wear their babies. What are some of Haiti’s greatest needs currently? Wow. That is a big question. They basically survive. When they wake up in the morning, it is about finding food for the day for their family. They fight cholera, malaria and other diseases such as dengue fever (break bone fever) on a daily basis. All of their clothes come from people who have donated to Haiti, and there are a lot of donations being sent. These people went through the most devastating event January 12, 2010, and they don’t even have time to process that because they just have to survive. It breaks your heart to the point of being emotionally paralyzed. Culturally, what have you found most intriguing about motherhood in Haiti vs. the US? The struggle. These women have to fight for their lives, and their families lives in a way that bonding/attachment becomes secondary to survival. The program, Heartline Women’s Program that I donate through is focusing on cultivating the bond between babies and mothers. 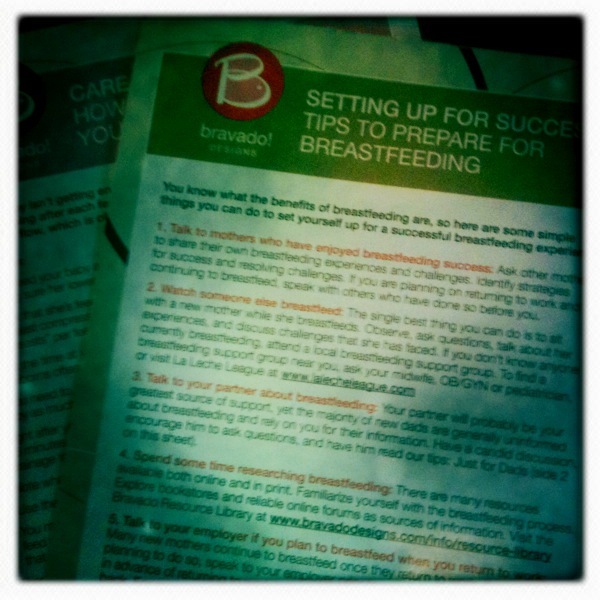 Exclusive breastfeeding is not common, but they, as well as many other programs in Haiti, are working diligently to educate the women of the importance of exclusive breastfeeding. Without it, women use old formula (that is super expensive) and contaminated water. That is why their babies become so sick and malnourished. The slings will aid so much in breastfeeding, because they can take their babies with them everywhere, versus leaving them at home (sometimes by themselves, or with other young children) so the mothers can get work to make money for food. These babies end up not being fed, and are in harms way without their mothers. Mothers are the primary caregiver for the whole family. Empowering these women, and keeping their babies safe is an unbelievable way to help these mothers. Any personal insights that you’ve walked away with? My first intuition that donating slings to mothers in Haiti was not just right, it is critical for decreasing a high infant mortality rate. The midwives who live and work in Haiti believe that Rockin’ Baby can create a cultural shift and benefit mothers and their babies in a way that could change their society. That was amazing to hear. I am charged with that goal. What are some of their greatest needs currently? Proper nutritionproper housing, educating the women about attaching tot heir babies, and absolutely, slings. How can we help from home? We can push this movement forward. I feel the momentum (especially since traveling to Haiti in August! ), and would like it to become viral like Toms did. It is less about the success of Rockin’ Baby, and more about the benefits mothers around the globe will have in bonding with their babies/toddlers! As a mother purchasing a Rockin’ Baby sling today, you are actually giving the gift of life to another mother and her child in Haiti (and eventually beyond). The impact is huge! 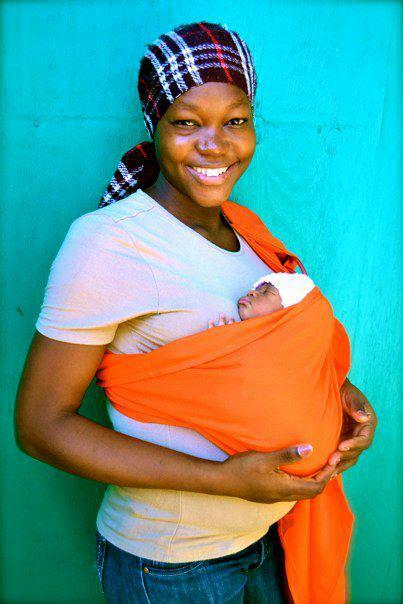 Now mothers can learn that slings can be part of their daily lives, no matter how they struggle with their basic needs. In turn, these babies will be healthier, more attached to their mothers and begin a life more fulfilled and optimistic. From you, to them.